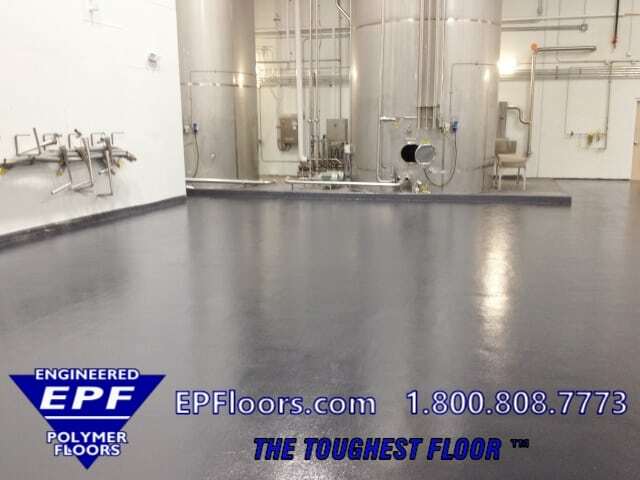 Beverage Flooring | Seamless Urethane Mortar Systems | Nationwide Installation. The beverage industry is diverse and covers a wide range of categories. 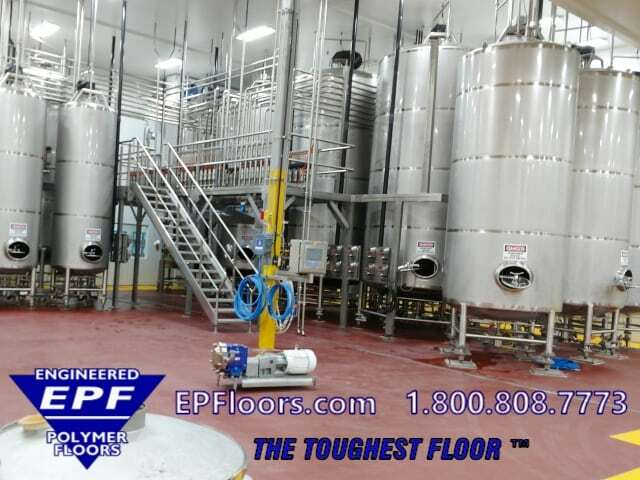 However, their flooring needs are quite similar throughout all of the various beverage industries. 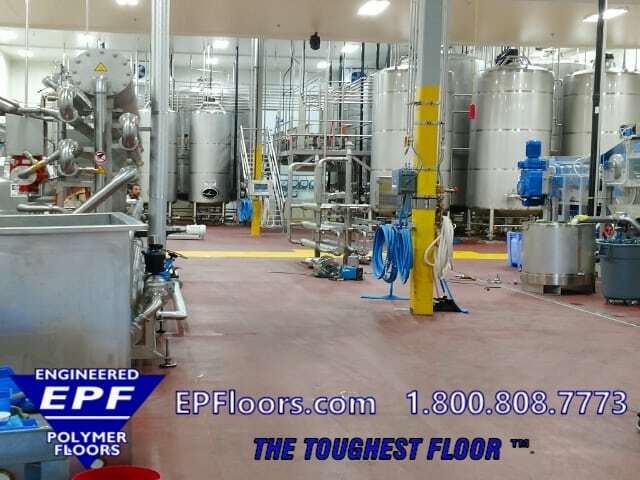 EPF has developed PUMA-CRETE® beverage flooring, which is a long lasting seamless floor suitable for breweries, fruit and vegetable juice drinks, dairy drinks, soda, energy drinks and all the other various specialty drinks. 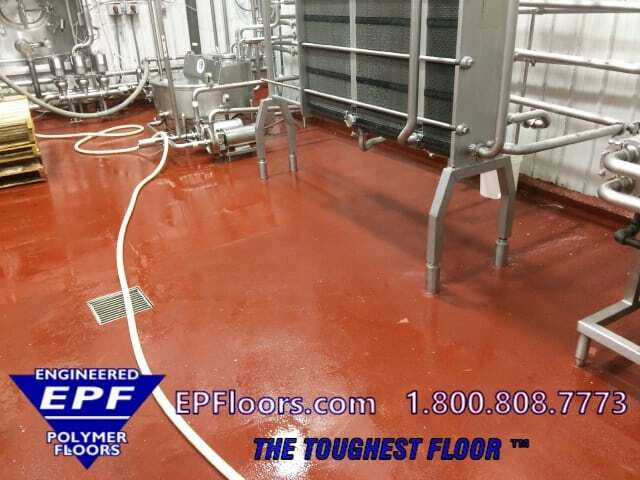 This heavy duty urethane flooring handles damp conditions, mechanical abuse, chemicals, and thermal shock. 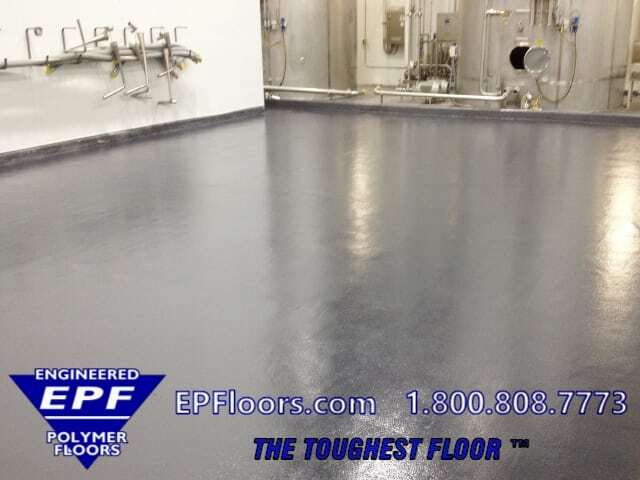 The floor finish is sanitary, easy to clean, USDA and SQF approved. If you have puddles or low areas, we can correct these, or slope entire areas to new drains. Drains needed? We can help with this as well. Since we are vertically integrated, we can handle your entire project from A-Z. We start with expert floor consulting services. We can handle Sloping to Drains, Concrete Slabs, Curbs, Drains and more. Furthermore, we manufacture the materials, install the flooring with our own company crews, and provide a single source warranty. 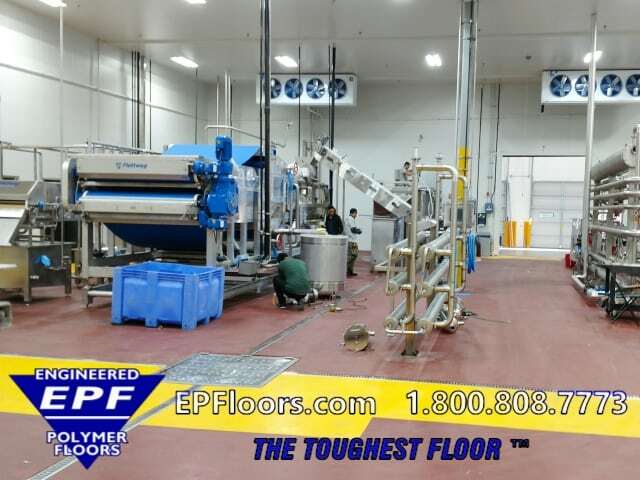 Since we have an exclusive USA application network, we are able to provide localized service throughout the U.S. EPF tightly controls all aspects of the work, to ensure quality through the entire process! Costs range from $8-12/sq foot installed, for our heavy duty PUMA-CRETE® system. 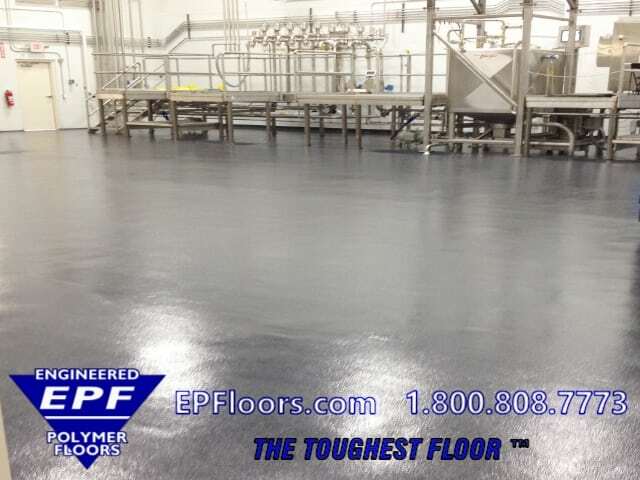 We also have epoxy floor coatings for lighter duty areas, which are just a few dollars per sq foot. We have over 30 years of experience in the food and beverage industry. 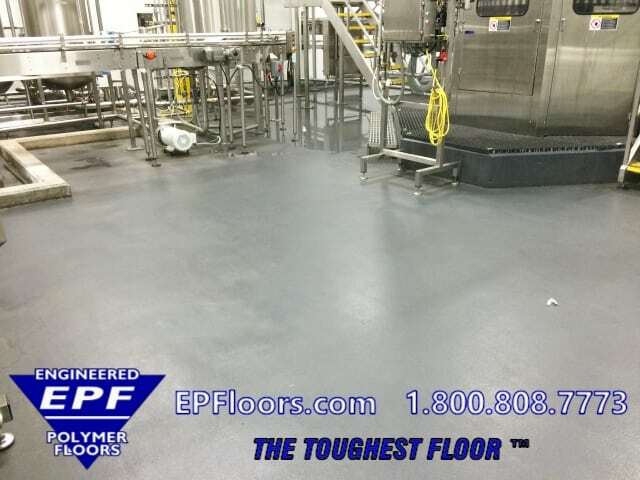 Our PUMA-CRETE® urethane concrete flooring will be the last floor that you will need! 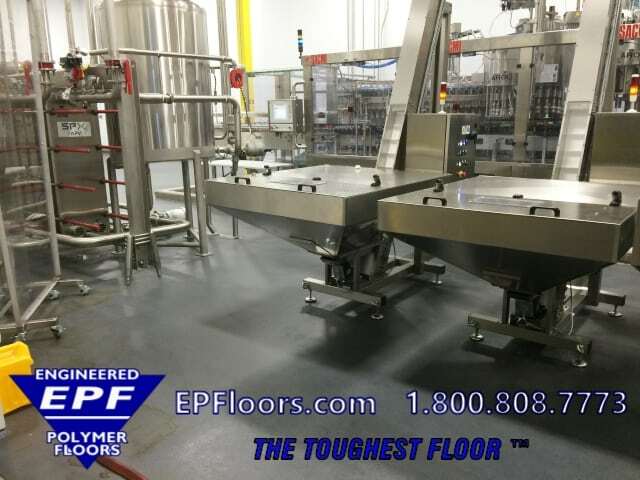 The food processing floor industry has evolved over the last decade or two. 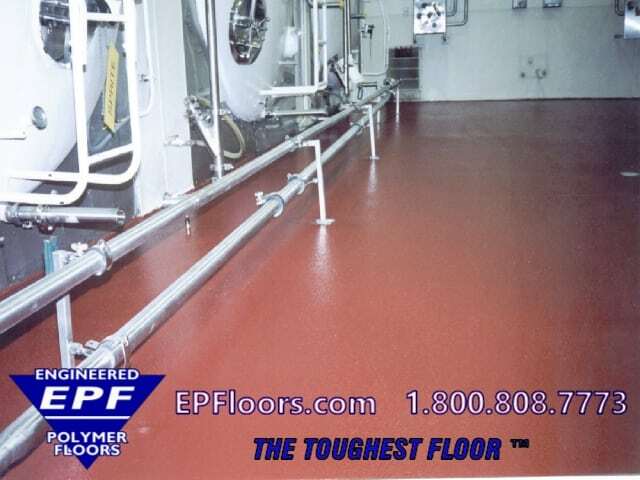 Once, epoxy flooring was the “go to” product for seamless flooring. 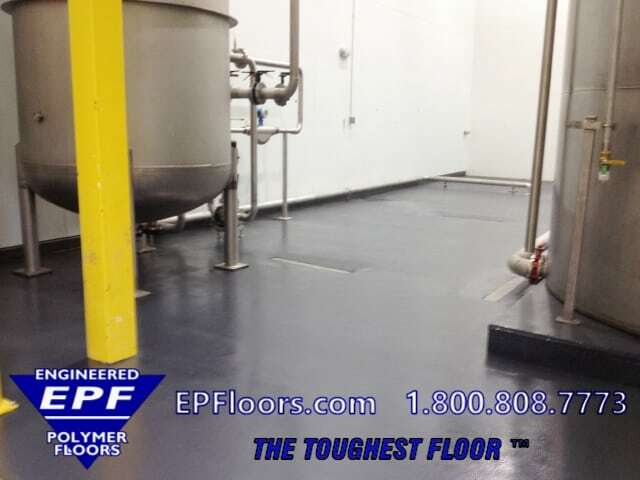 As urethane mortar floors came onto the market, epoxy was gradually replaced. Even urethane flooring has gone through many iterations over the years. Originally, a screeded and troweled mortar was the only option. Manufacturers tried to copy the original european product, Ucrete, to match it’s properties. Now, there very few manufacturers such as EPF, who have exceeded the performance and aesthetics of the original products. 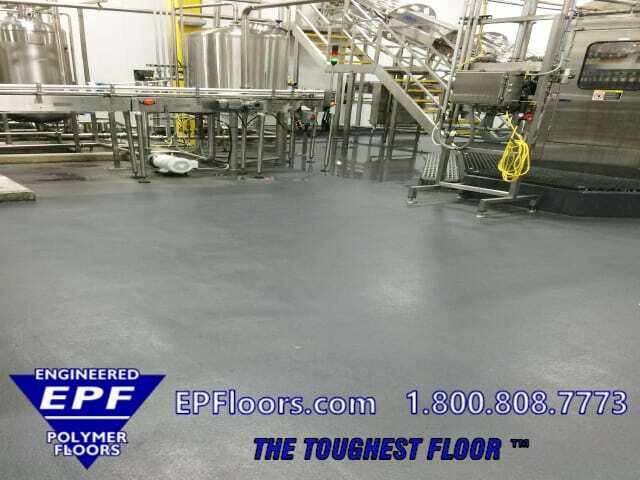 Our 1/4 inch PUMA-CRETE® HFB system features a polymeric top coat, which is easy to clean, satin to gloss finish, with a stain and mar resistant surface. This enables the floor to retain its original aesthetics, for much longer than previous urethane mortar. Additionally, it has the same durability, thermal shock and chemical resistance, and non slip texture as the original versions. Some examples of abuse in beverage facilities include heavy traffic, impact, scraping and gouging of the floors. PUMA-CRETE® excels in these types of environments. 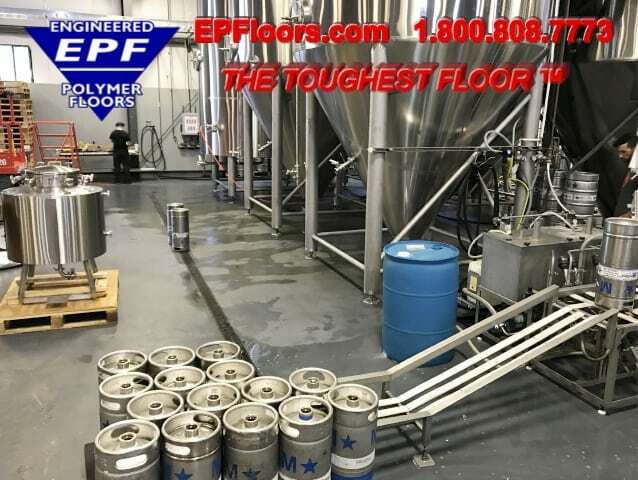 This 1/4 inch troweled urethane floor can handle all of this, and more. Another type of abuse is caused by large hoses and process pipe, which use metal clamps. These are used for transfer of liquids between tanks. The metal clamps get dropped and slammed onto the floor in the same areas, over and over again. 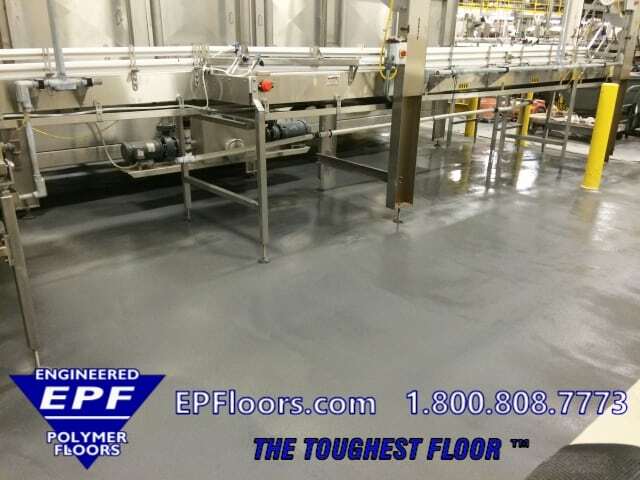 Our flooring handles this type of impact better than any other seamless industrial flooring. 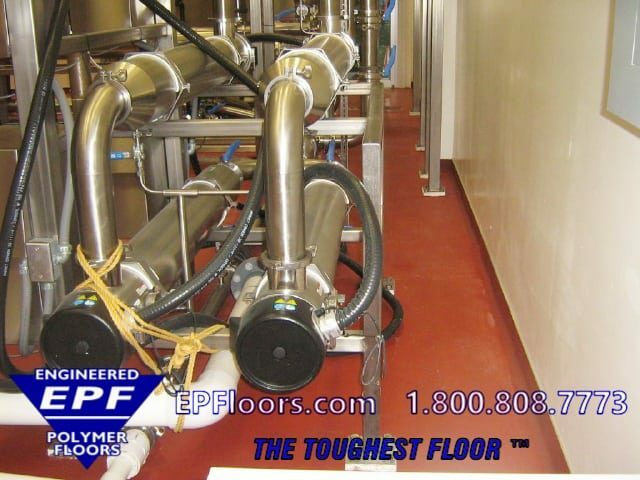 In beverage environments, floors must be easy wash down and sanitize. PUMA-CRETE® has a hard, dense easy to clean finish. The surface is stain resistant and chemical resistant. The seamless finish eliminates joints, cracks and other areas for bacterial growth. The finish does not support the growth of bacteria, and has antimicrobial properties. Optional integral cove base is available for the floor/wall junction. Customized textures are available, depending on level of wetness and type of cleaning employed for the areas. 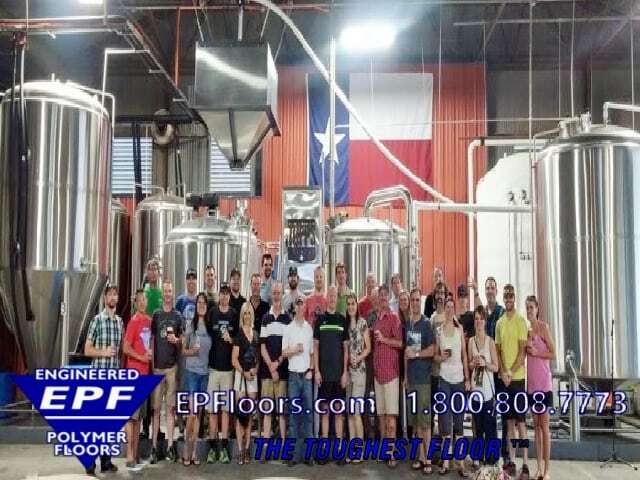 Many beverage flooring manufacturers must maintain floors in top condition, due to inspections and audits from their customers. With a durable, seamless and sanitary PUMA-CRETE® floor, you pass your floor inspections with flying colors! It is also USDA and SQF approved. Thermal shock is caused by hot wash downs, hot steam against the floor, or large spills of hot liquids. This will cause cracking in conventional floor coatings. 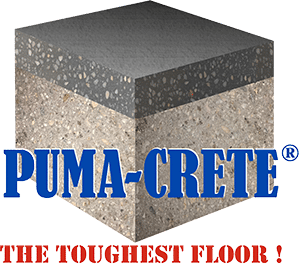 Since PUMA-CRETE® expands and contracts same rate as concrete, brick and tile, it will not crack or peel from thermal shock or thermal cycling. PUMA-CRETE® resists a wide range of acids, alkalis and solvents that are typically used in beverage processing facilities. This includes typical CIP chemicals used for cleaning the lines. For chemical storage rooms with concentrated chemicals, we employ custom resins such as a novolac polymers. These optional top coats can handle more aggressive chemical attack. Contact one of our flooring consultants for more information. Slip resistance is critical for safety in wet processing and wash down areas in beverage plants. PUMA-CRETE® has a permanent embedded slip resistant aggregate, which enables it to maintain its anti slip properties over the years. Floor texture can be custom designed for each area of your facility, depending on anti slip needs for each area. 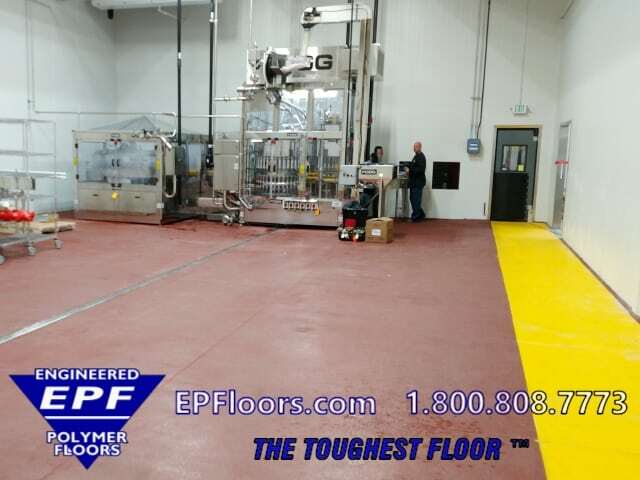 EPF installs the flooring that we manufacture, with our own company crews. Your project will include an experienced installation team with a project manager, site manager, team leader and 6-12 floor technicians. 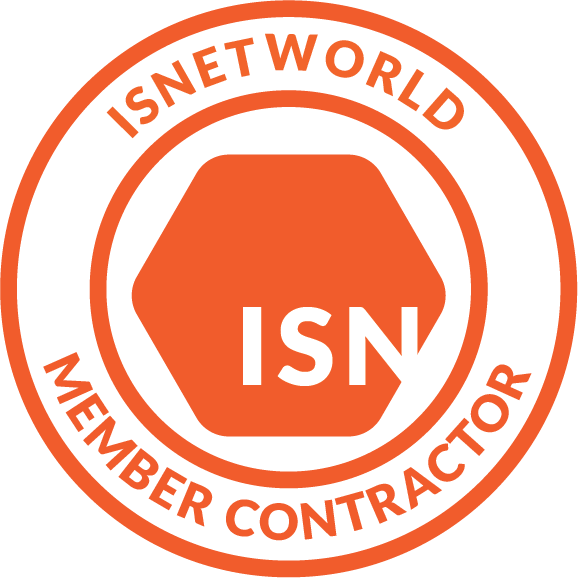 Since we do all of our own work, without sub-contractors, we are able to ensure good project communication and installation quality. A job readiness checklist is completed, to determine final schedule, site conditions, rules and requirements at your facility. Next, a custom project checklist is prepared, which is adhered to closely during the project. This checklist ensures thorough completion of each task, from the time our team arrives, until completion and departure. 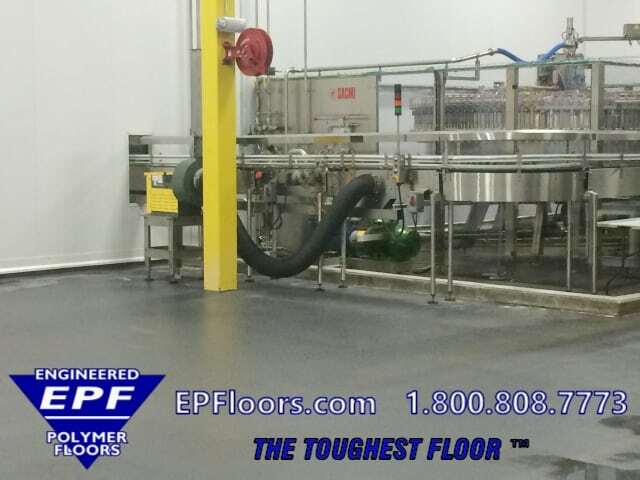 EPF has invested over $1 million in specialty surface prep and application equipment. This ensure that dust is kept to an absolute minimum, and the work proceeds quickly and efficiently, to its successful on time completion. Oftentimes, a floor must be installed at low temperature, inside a cooler. This requires that flooring materials that will cure at temperatures as low as 35 degrees, or even sub freezing temperatures. 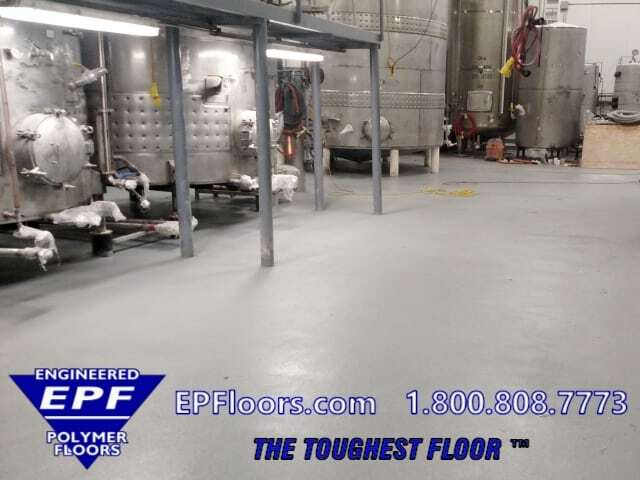 Our standard Puma-Crete flooring will cure down to 35 degrees F. Optimally, we ask customers to set temperature between 40 to 50 degrees during the installation. This speeds the curing, prevents condensation on walls/ceilings, and is an optimal temperature for application of Puma-Crete inside coolers. Check out the Puma-Crete Advantages over our competition !